We all know that when we’re at the top of the cliff, if we don’t connect ourselves to something solid and we trip/slip/fall, we stand the risk of dramatically reducing our climbing career by way of possible death. So, most of us attach ourselves to something once we feel like we’re entering the Danger Zone (can you hear Archer’s voice?). As a climbing guide, I have come across countless people unknowingly putting themselves in a situation where they might experience a Factor-2 Fall because of the way they are tethering themselves. For those not sure what I just said, know that a Factor-2 Fall is bad. Like real bad. Like the most shock-loading you can put on your climbing system and the types of fall most likely to cause all your systems to fail kinda bad. 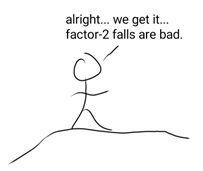 If you want more info on what a factor-2 fall is or how to calculate fall factors, feel free to check out my article (it’s ok, go ahead, we’ll wait for you to come back to explain the whole danger tethering thing). Step 2: Be properly tied-in whenever you’re in the danger zone so that you don’t go much further down the cliff if you slip or fall. Step 3: Look slightly off in the distance for pictures as though the camera weren’t there (we all know the camera’s there). 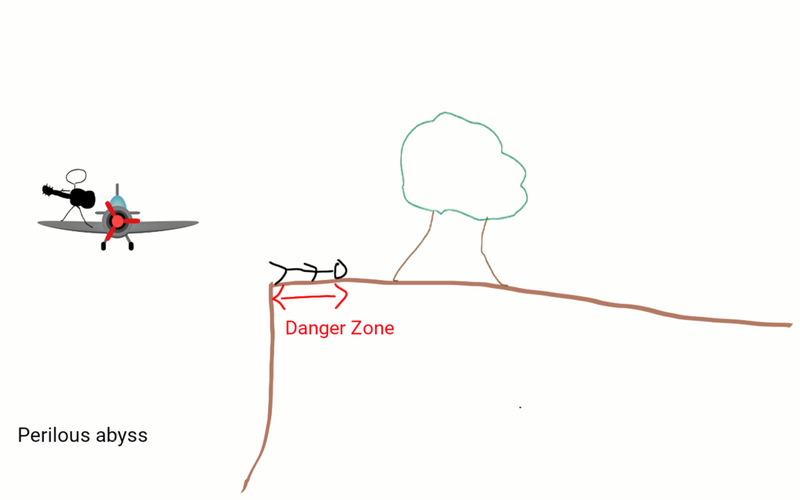 When you get to the top of the cliff, decide where your Danger Zone is (you heard Archer’s voice again, didn’t you?) and make sure you’re properly tied to something whenever you get into that Danger Zone. Each cliff top will have a different zone, and each climber will feel different levels of comfort in different terrains. As a general rule, if you’re within 1 body length of a cliff edge (think 6 feet from the edge) and your focus is not 100% on not falling off the edge (as in you’re doing ANYTHING else except making sure you’re not falling off the edge, such as talking to someone or working on an anchor), you should probably be tied in to something. Does this mean that I’m going to wait to tie myself in until I’m 1 body length away from the edge of a cliff if the clifftop slopes downwards, or if there’s a lot of loose gravel at the top? Hells no! You need to do what makes the most sense for you given your abilities and the circumstances you’re in. But I digress. It’s in that second step that people accidentally put themselves in a bad spot, and where the rest of this article will focus on. What you’re supposed to do is find an anchor further away from the cliff edge than you, like in the picture. In this case, our awesome climber used a tree that was further away from the edge of the cliff. This way, if they fall while their buddy is taking a picture, they can’t possibly fall down the cliff, and especially cannot fall past their anchor, putting them in a potential factor-2 fall situation. What I’ve seen time after time, especially in situations where there are bolted anchors at the edge of a cliff, or just below the edge of a cliff, is that people will take their P.A.S (Personal Anchor System), lanyard, or whatever leash they have on and simply clip it to the bolts. This inadvertently puts them in a situation where if they fall, they have no choice but to experience something close to factor-2 fall in a static environment. This put tremendous forces on the bolts, on the leash, and on the climber. The force is so great that different leash systems have been known to literally snap under the same setup. Pretty grim for our stick figure climber. There’s no coming back from a perilous abyss. Don’t let our stick figure climber’s sacrifice be for nothing. Set up proper tether systems for yourself when you’re hanging out at the top of cliffs. Older PostHow long does food last on a camping trip?